This week, we’ll cover a couple of things: how to rank as a healer, and how to evaluate your healing team. To accomplish this, I’ll walk you through a series of experiments that our team conducted on a fresh clear of Hellfire Citadel last Tuesday. I encourage you to do similar experiments for you team, at least for the bosses you have on farm. First things first: if you are not a Discipline Priest and you want to rank, you need to do so when there isn’t a Discipline Priest around. As you probably already know, they use a lot of shields in their healing bag of tricks, which take precedence over all other types of heals. When damage is low, like at the start of a fight, the shields pick up all of the healing and everyone else has to play catch-up on the meters. The other most important factor to ranking is to have as few healers as possible. I took a look at the top healing ranks for the first few fights and not surprisingly, it turns out most of them are 2-healing teams of 20 or more. Lothrik and Qtpop, 2-healed a team of 25 to earn the #1 and #7 overall ranked spots. Daktari solo healed a team of 17 and earned the #4 rank on Kormrok. You see the trend! We are an average Heroic raid team with pretty average gear. We wanted to see if we could get a healer to rank, not only because it would be fun, but because it would make some of the fights more challenging. 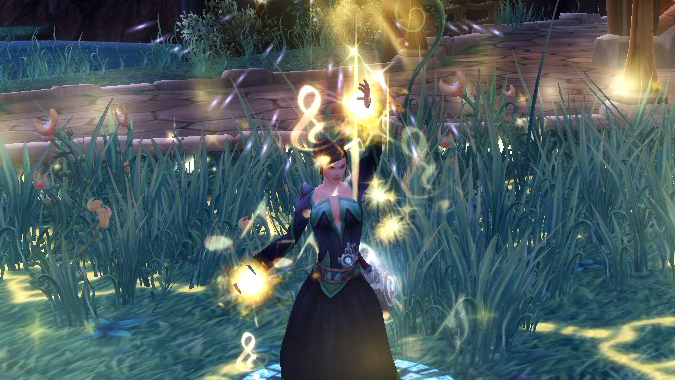 Ask your healers: some of these fights are mind-numbing when they are on farm. We had 5 healers show up for a team of 20. That’s one more than is generally recommended, but we ran with it anyway. Add in the Discipline Priest and I was pretty sure all of our healing would look mediocre – the Priest’s shields would absorb all of the damage before any of us had a chance to heal on Hellfire Assault. I see a lot of teams running with too many healers, so I thought this would be a nice experiment to get a base line for a typical healing team. And it turns out, I was right. Bottombear, our Discipline Priest, doubled the healing of the next closest person. Look at the column on the left below, the rank by spec+iLevel: all but the top healer look pretty terrible. We also had a side-experiment going on: Yolked played a game of Hearthstone while healing to see how much further behind he’d be while not paying attention. It turns out, not that far behind our two Druids who healed their wooden hearts out. But he did at least win his game of Hearthstone. Conclusion: when you have too many healers (and a Discipline Priest), it doesn’t matter if your healers are playing Hearthstone or trying as hard as possible… they will still look bad. I swear we aren’t bad, but it sure looks that way, doesn’t it? That brings us to the next experiment. Experiment #2: Can we get a healer to rank? First, we had to get rid of our Discipline Priest to give another healer a shot at ranking (and not being bored to death). We decided since Yolked won his game of Hearthstone, he was going to get the chance to rank. Kidding, he got it since he had his legendary ring and is probably our strongest healer. We kept all other healers around for the next boss, Iron Reaver, with strict instructions to NOT heal unless absolutely necessary. Yolked did end up ranking: #26 among Holy Priests. He called dibs to cooldown on the first Pounding: he popped the legendary ring, had the crit proc from Intuition’s Gift going, and Divine Hymn. He was able to do this a second time at the very end of the fight as well since we didn’t kill Iron Reaver before the air phase. However, we were actually surprised he didn’t rank a bit higher so we dug into the details – take a look at the graph below. It turns out, not everyone followed instructions. Loadie used Tranquility at the same time as Yolked’s big cooldown, snarfing heals. In fact, Yolked’s Divine Hymn had 60% overhealing because of the Tranquility. If you want a healer to rank, your team can’t have competing heals. This was also a good experiment to find out who listens to directions – not working together as a healing team causes wipes on progression bosses. We’ve all been there… your team doubles up big cooldowns, someone overheals then runs out of mana, and so on. It’s hard to not heal at all, and it’s hard to trust that your other healer will save everyone. It takes a lot of restraint to let it play out, and that’s where you’ll find out what each healer is made of. Conclusion: Ranking as a healer is just as hard as ranking for DPS, and it requires a team effort with specific assignments, just like DPS. If one person snarfs heals, just like DPS, the ranking will suffer. The intention behind this experiment wasn’t to rank — it was instead to find out how well each healer performed when pushed to their maximum. We had all healers switch to DPS except three of us to heal a team of 21 for Kormrok. The instructions were to heal as much as possible and see how well each of us performed. This was the test to find out who was skilled and who wasn’t. Remember we all looked bad on Hellfire Assault in experiment #1? The theory here was that having fewer healers would let skilled people shine, and expose healing weaknesses. Loadie died, and I swear that wasn’t on purpose for his previous heal-sniping on Iron Reaver. So we weren’t able to evaluate him during this experiment. That left just Yolked and myself (Zoopercat) to heal as much as possible. People died, but Yolked did score rank #6 among Holy Priests. And I was in the 93rd percentile for the spec and item level. And if you take a look at the graph, you’ll see how nicely we spaced out each healer’s big cooldowns — that’s what we like to see during fights. Also, recall at the beginning of this article I mentioned that most of the top ranked healers have small healing teams. We weren’t trying to rank on this boss, but perhaps we should have done that experiment on this boss instead of Iron Reaver. On Lothrik and Qtpop, we 2-healed a team of 25 to earn the #1 and #7 overall ranked spots. Daktari solo healed a team of 17 and earned the #4 rank. This might be a fun fight for your team to actually try to rank — you have nothing to lose except a wipe or two, and your healers will have a lot of fun! Anyway, back to evaluating healers: an experiment like this lets you also evaluate the spell choices of each healer, since they should be using everything possible to keep the team alive. I’ll take myself (Zoopercat) as an example. I kept Harmony up 96% of the time (that’s my Mastery that gives bonus healing to my HoTs). That’s really good, and although it should be 100%, I’m still happy with my performance. But on that same report, you see that I only used Nature’s Vigil once, which is a boost to my healing with a 1.5 minute cooldown. I know I’m not good at using big cooldowns and that is something I have to improve. When things are easy, I am pretty good at using Wild Growth (my AOE heal) and Lifebloom (my tank HOT), but for some reason when things were crazy in this fight, I didn’t use them nearly enough. And Switfmend, which instantly heals a target (on a 15-second cooldown), was only used 7 times. I am pretty embarrassed about that! You can see how I might be dismissive if someone brought these things to my attention for the Hellfire Assault fight (experiment #1)… I could easily say, “We didn’t need the heals. Of course I know to use them more but I didn’t feel like padding the meters.” Take those excuses away in a fight where we 2-healed 21 people and I’m much more receptive to that feedback: I can readily admit that I need to work on a few key things. If you need help evaluating yourself or another healer, try the comparison feature. It will find a player with similar gear, who did better than you, and compares spell usage, average heal per hit, uptimes and more. Here’s an example comparison for my character, Zoopercat. Conclusion: taking one less healer (or even two less!) than your team is comfortable with pushes healers to their limits. 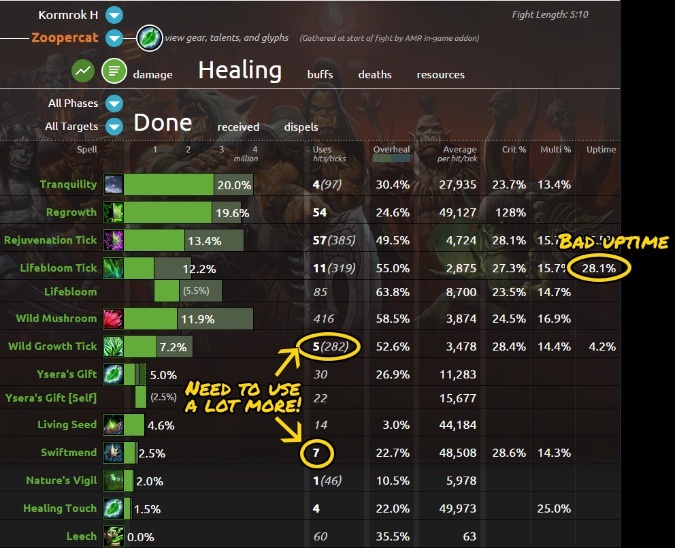 This shows you who has the real healing chops and helps you honestly evaluate each healer’s spell choices. I learned the most about my own healing from this experiment. Not only did we have fun with our experiments, but we learned quite a bit about our team. I encourage you to do something similar. Tell me how it goes (leave a comment, tweet @AskMrRobot or @Zoopercat, etc). I’d also like to hear how you evaluate healers and your own strategies for grabbing top heal ranks.